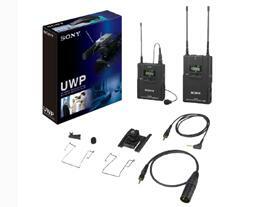 The Sony UWP-V1 Wireless Lavalier Microphone System replaces its UWP-C series predecessor with enhancements that include a rugged, all-metal chassis and Mic/Line switchable input at the transmitter. PLL-synthesized tuning, space-diversity reception and all other professional wireless features that made the UWP-C series a popular choice, go into the enhanced UWP-V1 system. The camera-mountable receiver features space-diversity technology which stabilizes reception and minimizes RF interference by selecting the strongest incoming signal. In addition the antennas swivel so that you can achieve even stronger reception. A stereo mini jack output with monitor volume control is featured and both stereo, mini and XLR cables are provided. An LCD display provides channel & frequency information, battery life, RF-input level, audio-output status and accumulated operating time. The receiver operates on 2 AA batteries for up to 8 hours and its compact design and included shoe-mount adapter allows easy mounting to most camcorders. The improved body-pack transmitter features a microphone and line level input switch. This allows wireless transmission of microphone or line level signals. Like the receiver, the body-pack transmitter also features 188 selectable UHF frequencies and operates up to 8 hours on 2 AA size alkaline batteries. An omnidirectonal lavalier microphone is supplied with this system. Improved All Metal Construction The transmitter and receiver both feature metal construction for maximum durability on the road. Mic and Line Input Switch The transmitter features microphone and line level switching for transmitting microphones or line level signal sources. UHF Synthesized Frequencies Both transmitter and receiver provide 188 user selectable frequencies, providing plenty of options when interference is present. Space Diversity Receiver The receiver features a space diversity design which simply chooses the strongest signal between the dual incoming signals, then sends that signal to output. Selectable RF Output The transmitter allows selection between 5mW output power and 30mW output. 5mW is suitable for indoor, simultaneous multi-channel operation while 30mW is intended for outdoor, long-range use. Comprehensive Display Both transmitter and receiver feature a comprehensive LED display providing channel and frequency information, battery life, total usage time and more. Omnidirectional Lavalier A high-quality omnidirectional lavalier microphone provides the sonic quality needed to handle professional and non-professional applications.